Be that as it may, let’s take a quick look at what I call the “Earth – Moon System”. As some (most??) readers probably already know, there are many objects in addition to the Moon that share Earth’s orbital path around the Sun. To understand how that works we must look a little deeper into the Sun-Earth system, as illustrated in the graphic, below (borrowed from Wikipedia and NOT to scale). There are some interesting things and happenings there . . .
An asteroid, or other massive body, can orbit the Lagrange Points (small blue dots) labeled L1, L2, L3, and L4. This is a bit odd because there is really nothing solid located at a Lagrange Point – a Lagrange Point is a confluence of gravity force from relatively nearby objects, in this illustration, where the gravity from the Sun and the Earth come together. Yes, the gravity from the Moon is also involved, but that complicates things (and makes for a messy illustration) so let’s ignore that, for now. 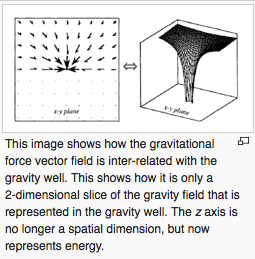 These Lagrange Points are relatively small Gravity Wells, sometimes called Gravity Dimples, in the fabric of Space-Time, as illustrated, below, which I have borrowed from Wikipedia. Gravity wells or dimples, are a way to understand how gravity works without doing the math. All we need to know in order to understand what causes Lagrange Points is that anything that has mass can create a depression in Space-Time and the “depression” is what causes what we call “gravity” to happen. Here is an illustration (borrowed from Wikipedia) that (sort of) illustrates this concept . . . If an object is massive enough it creates a very deep Gravity Well that produces a “Black Hole”, but that’s a story for another day. That’s quite enough cosmology for now – let’s get back to Trojans, and such. Earth’s only Trojan, named 2010 TK7, is a 300-meter diameter Asteroid. The name “Trojan” was first used in 1906 for Jupiter’s Trojans, the asteroids that were observed near the Lagrangian points of Jupiter’s orbit (see below). “Trojan” is sometimes used as a generic term for all objects that orbit around Lagrange Points, and sometimes used for specific Lagrange Points L1, L2, L3, and/or L4. Notice in the illustration below that the objects are referred to Trojans (green), Hildas (red), and Greeks (also green) depending upon which Lagrange point they gather around. In order to clarify which Trojan or Trojans are being referenced, double -Naming, such as “Greek-Trojan” or “Hilda-Trojan” are used. Note, also, the Asteroid Belt in white. At the scale of this drawing, Earth’s one Trojan is not visible. One other note of interest – – it is quite good neighborly of Jupiter with its huge gravity well to capture all those Trojans, Greeks, and Hildas because some of them were probably headed toward Earth and could have done considerable damage when they collided with our home planet. For a more detailed discussion (including the names) of about 150 of Jupiter’s Trojans, I suggest a visit to Wikipedia – it would require multiple pages to include all the information here on this blog entry. Getting back to Earth . . .
2010 TK7, A 300-meter-diameter asteroid, discovered and photographed using the Wide-field Infrared Survey Explorer (WISE) is the only confirmed Earth Trojan. 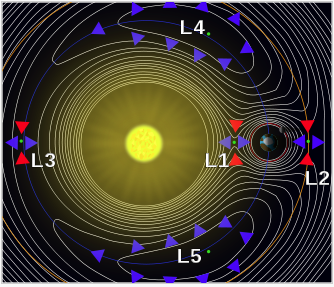 Earth’s lonely Trojan orbits the L4 Lagrange point traveling “in front” of Earth in the Earth’s orbit. There are a dozen or so additional objects in the Earth-Moon “family” and they have rather strange “orbits” as they follow or lead along Earth’s orbital path. 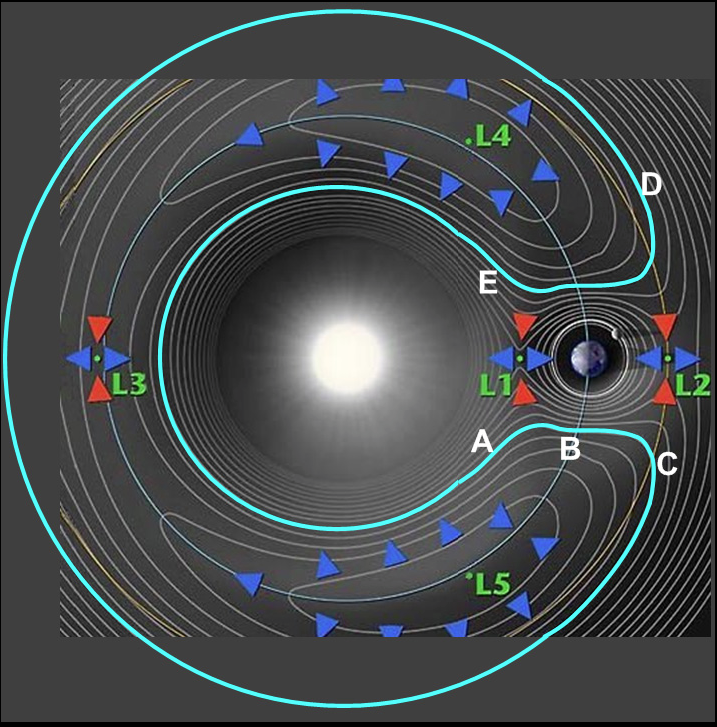 The lighter gray lines represent gravity, which determines the path of Horseshoe orbit (green). The loop is not closed but will drift forward or backward slightly on each orbit, so that the point it circles will appear to move smoothly along the larger body’s orbit over a long period of time. When the object approaches the Earth closely at either end of its trajectory, its apparent direction changes. Over an entire cycle the center traces the outline of a horseshoe, with the larger body between the ‘horns’. 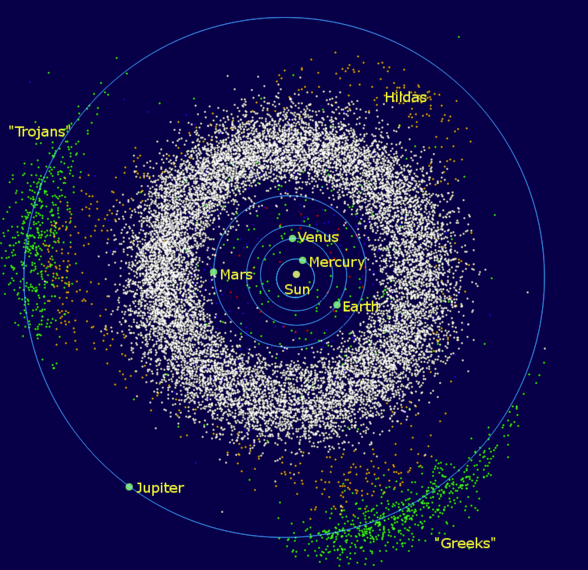 Asteroids in horseshoe orbits with respect to Earth include 54509 YORP, 2002 AA29, and 2010 SO16. In closing, there are other types of Trojan orbits, one is called the “Tadpole” because it traces an outline resembling a tadpole. The blue triangles around L4 and L5 illustrate the outline of the Tadpole orbits. Another one is called a “Halo” orbit because it is less complicated (more “normal”) than the other types of orbits. By the way, the James Web Space Telescope (JWST) scheduled to be launched in October 2018 ( if the U.S. Congress continues to fund it) will be placed in orbit around the Sun-Earth L2 Lagrange Point. As promised in my previous post, here is a list of Terminology, Definitions, and Acronyms I have accumulated during my research into space travel in general and NASA jargon in particular. I hope you will find the list to be useful and interesting. The list will grow as I do more research into this fascinating subject. Asteroid Redirect Mission (ARM): This mission (or missions) will place an asteroid into cislunar space as well as return samples to the ISS and/or Earth for further study. Asteroid Redirect Robotic Vehicle (ARRV): The Asteroid Redirect Mission (ARM), also known as the Asteroid Retrieval and Utilization (ARU) mission and the Asteroid Initiative, is a potential future space mission proposed by NASA. Still in the early stages of planning and development, the spacecraft would rendezvous with a large near-Earth asteroid and use robotic arms with anchoring grippers to retrieve a 6-meter boulder from the asteroid. Cislunar: The spherical space surrounding the earth with a radius of the distance from the center of the earth to the center of the moon. European Space Agency (ESA): The European version of NASA. Exploration Upper Stage (EUS): A rocket stage that sits atop the Core (main) stage of the SLS rocket, Block 1B and Block 2 assemblies. There are three versions of the SLS rocket: Block 1, Block 1B, and Block 2 (see SLS, below, for details). The four RS-25 main engines. Commercial Crew Transportation Capability (CCtCap): A program in progress to use COTS to carry supplies to the ISS with vehicles supplied by Boeing, Space X, etc. Commercial Orbital Transportation Services (COTS): A NASA sponsored program to encourage companies to develop systems to provide supply services to cislunar space. Companies such as Boeing and Orbital ATK have already begun to deliver cargo to the ISS. Entry, Descent, and Landing (EDL): Stages of taking things from orbit and placing them on the surface of a planet, moon, asteroid, or comet. Indian Space Research Organization (ISRO): The Indian version of NASA. In Situ Resource Utilization (ISRU): A type of device that will produce essential resources, such as Oxygen on the ISS and eventually on Mars. Also, see MOXIE, below. 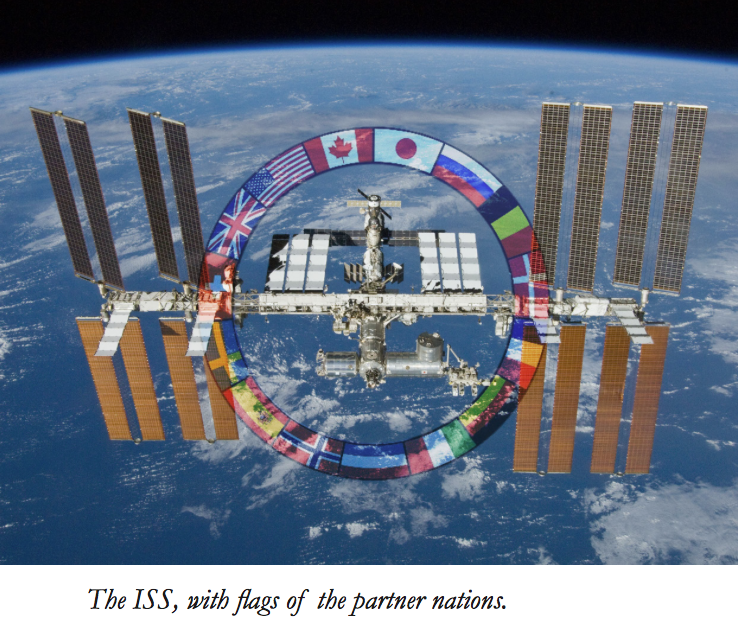 International Space Station (ISS): One of America’s National Laboratories where LEO research and training is done. As of October 2015 astronauts from 17 countries have lived and worked on the ISS for various periods of times during the past 15 years or so. Currently (October 2015) two astronauts (one Russian and one American) are about half way through a 1-year assignment aboard the ISS. The “normal” assignment for each of the 6-person crew is six months, or less. Interior Exploration Using Seismic Investigations, Geodesy, and Heat Transport (InSight): A robotic MARS lander scheduled for launch in 2016 that will investigate the interior (geophysical) processes that formed Mars’s core, mantle, and crust, comparing these processes to the Earth. In addition, InSight will also investigate seismic and meteorite impact rates on Mars. Low Earth Orbit (LEO): An orbit around Earth with an altitude between 160 kilometers (99 mi) (orbital period of about 88 minutes), and 2,000 kilometers (1,200 mi) (with an orbital period of about 127 minutes). Lunar Reconnaissance Orbiter (LRO): A Moon orbiter currently in operation at Earth’s Moon. MOXIE: A small experimental ISRU device that extracts Oxygen from carbon dioxide (CO2 in a process called “solid oxide electrolysis”. MOXIE will be tested on the ISS and will be a part of the 2020 rover. 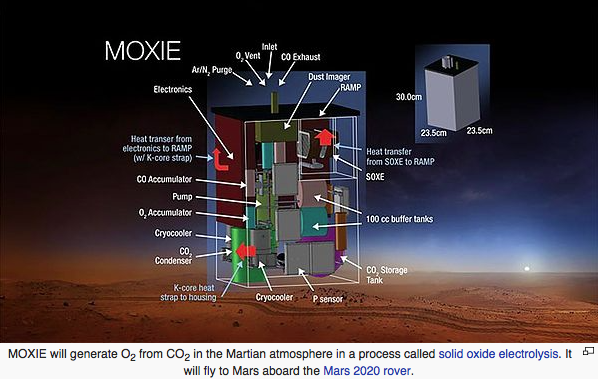 Full size versions of MOXIE will be sent to Mars ahead of manned flights to produce and store oxygen to be used by the astronauts when they arrive, and during their stay on the surface of Mars as well as on the Mars Return Vehicle (MRV). 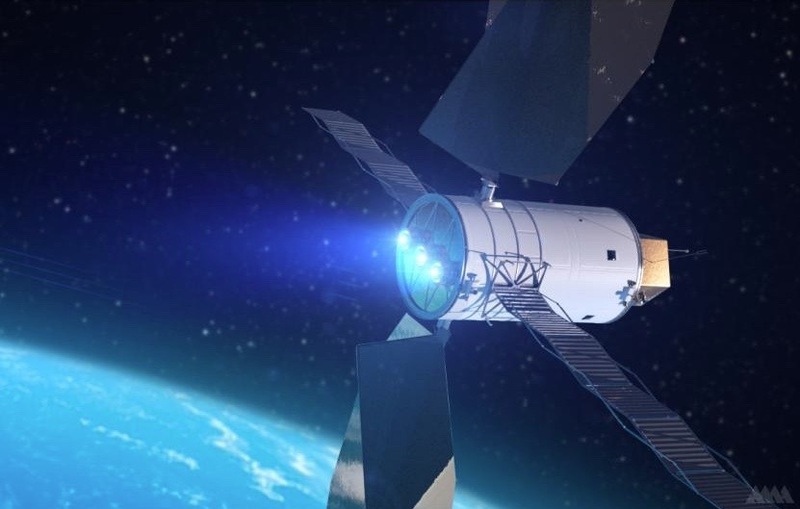 Solar Electric Propulsion (SEP): A type of rocket engine that uses solar power from solar panels to accelerate ionized propellant (plasma) for thrust. These engines do not produce as much thrust as chemical engines, but they are much more efficient, allowing much more mass to be transported with far less fuel. This type of engine was used for NASA’s Dawn Mission which sent an orbiting robot to asteroids Vesta and Seres (This was the first ever mission that visited and orbited two different asteroids). 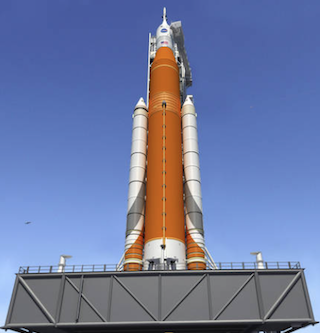 Space Launch System (SLS): NASA defines the SLS as “Orion’s ride to deep space”. Arguably, the most interesting and exciting item for the Journey to Mars is the SLS rocket, which will be the largest and most powerful rocket ever built. SLS is actually three different versions of the rocket that will eventually take the Orion spacecraft and 4 astronauts to MARS. 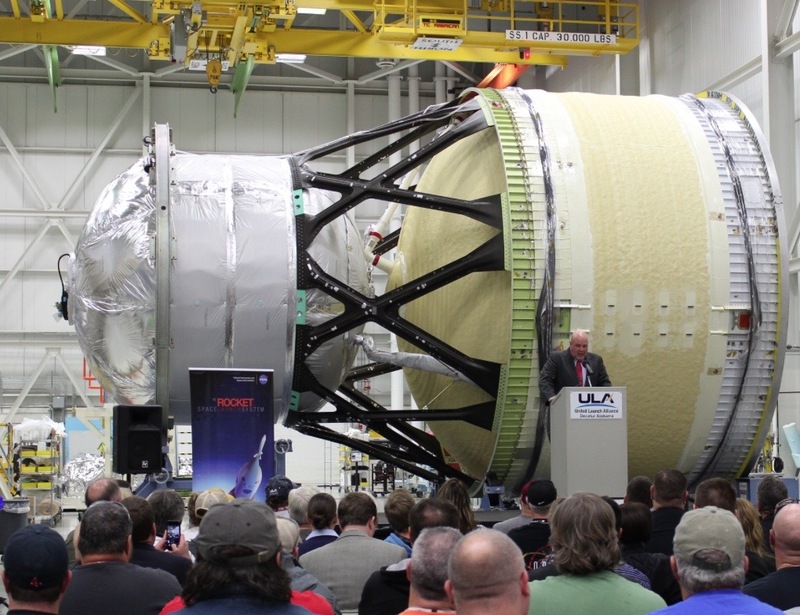 The third and final version of SLS will be capable of launching 130 metric tons into space. 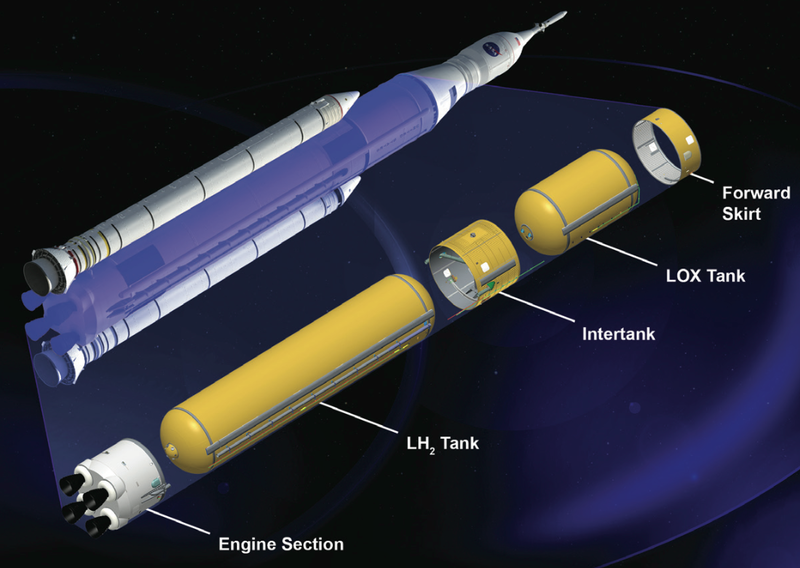 Nasa has it’s own way of naming things, so these three versions of the SLS are called Block 1, Block 1B, and Block 2. SLS Block 1B will add an expanded upper stage. Exploration Mission 2 (EM-2) will be manned and will test and validate key operational capabilities that are required to become Earth Independent. SLS Block 2 will add advanced boosters (the largest and most powerful solid fuel rockets ever built) to replace the original boosters used versions 1 and 1B. This third and final version of the SLS rocket will be used for testing deep space habitats, an Asteroid Return Mission (ARM) and eventually manned missions to Mars. 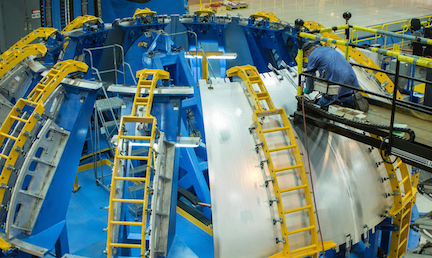 Shown, below, is a part of the SLS where the four RS25 main engines attach to the rocket on the adapter to the left (white) and the bottom section of the Core Stage on the right (yellowish). This structure has passed all preliminary tests and is ready to be assembled to the rest of the rocket. ￼Below is a photo of SLS Block 1 on its way to the launch pad for initial integration testing. This test will NOT actually launch the rocket. That tiny little cone shaped thing on top is an Orion Space Craft where astronauts can ride, but not for this unmanned, no launch test . . .
. . . and here is an alternate view looking down from the top showing the Orion spacecraft. And, that’s all I have ready for prime time right now. Not sure what will be next, but I have a couple of things in the works. Take care, and visit the NASA website often – – they have TONS of wonderful stuff there, including NASA TV from the ISS. No – – its not all “live” – – lots of reruns because there is simply not that much visually exciting stuff happening on the ISS – unless you like watching astronauts do household chores, ISS maintenance chores, and scientific research. Scientific research and maintenance chores are very important, but they don’t make “good TV”. A few months ago, before I had ever heard of Andy Weir or his book, “The Martian” I realized that I had not posted anything to this blog for a long, l-o-n-g time because various distractions had been eating up all my time and energy. So, I decided to correct the situation by creating some new material, just to get back into the swing of things, so to speak. I knew that my former readers (both of them) had probably long since removed me from their reading list and forgotten all about this blog. OK, I have work to do in order to create something that will be of interest to new readers as well as the former ones. “Something that will be of interest” should, of course, be something in which I have a genuine interest; otherwise it would simply turn into a chore.
. . . and what, exactly, would that something of interest be? I asked myself. After quite a while mulling the search for just the right subject, I decided to write about NASA, space flight, etc. because those sorts of things have been of interest to me since before there was a NASA. Not only that, but this seems to be of interest to the general public these days. Just about the time I had my first new entry ready for prime time (not what you are reading now), here came Andy Weir and “The Martian”. I bought the book, read it (twice) and watched the movie (3D, on the biggest screen in the county). Both the book and the movie are excellent – in my totally unbiased opinion. By exercising all the discipline I could muster, I got back to working on this blog and suddenly realized that anyone who was interested in NASA, space flight, etc. would probably go to NASA’s website to get information. Here I am wasting my potential reader’s time by posting information that the reader can get or has already gotten from the same place that I get most if my ideas and information. Brazzelfratzz !!!! Foiled, again ! I have already compiled (for my own use) something that may be of interest to fans of NASA, SiFi, space travel, etc. : a list of Terminology, Definitions, and Acronyms related to the space industry in general and NASA in particular. And that list, dear reader, is what I will post next here on this blog. The Orion Spacecraft has successfully completed it’s first “live” test today, 05 December 2014. At this time, Orion is the leading candidate to be the spacecraft that will (finally!) take a crew of humans to Mars sometime in the 2030’s. The launch earlier this morning is shown to the left. The Orion capsule was safely tucked sway atop the Delta IV rocket. All indications are that this unmanned test flight was a rousing success regarding the information that has been collected from the instruments aboard. The image below is from a “screen shot” that I took while watching the launch and subsequent flight in real time on NASA TV earlier this morning. 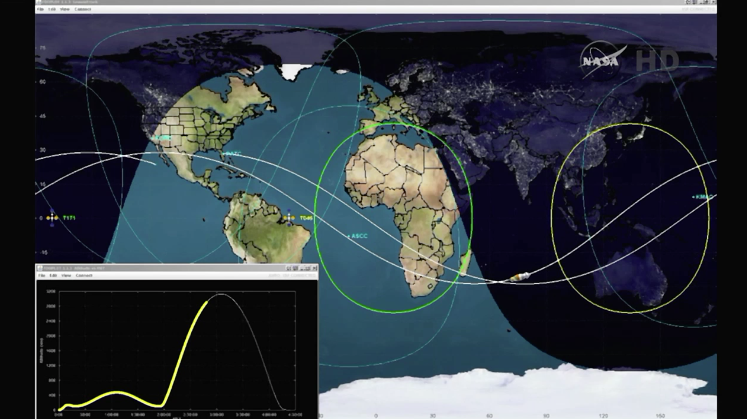 The actual path of the spacecraft in orbit is shown, along with an insert in the lower left-hand corner, which shows the “altitude” of the craft. I caught this image just 10 minutes before the craft reached the peak of it’s orbit, and began the long plunge back to Earth. The Orion spacecraft attained an orbit much farther above the Earth than the International Space Station. At the peak of Orion’s elliptical orbit it was about 3,600 miles above the Earth’s surface before beginning it’s long fall back to the targeted landing spot about 600 miles west of Baja California. During the exciting days of NASA’s Apollo missions, many people, including myself, expected that we would have left footprints in the sands of Mars by now (2014), but alas, there are so many wars to be fought that we have reduced the priority of space exploration to a pale shadow of what was expected. 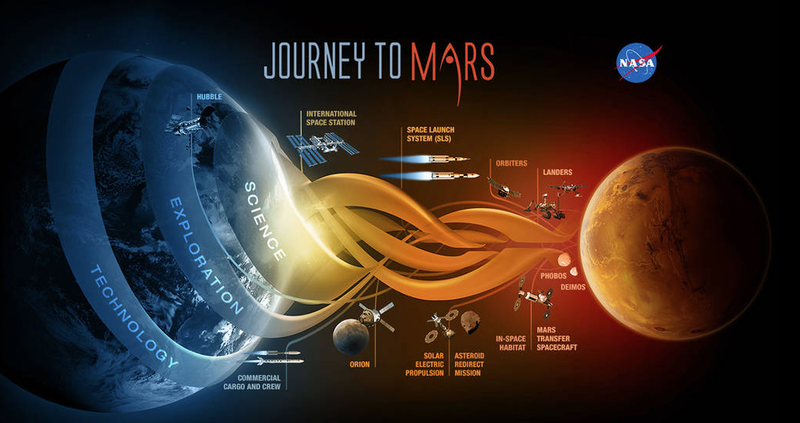 Be that as it may, we have now taken the first tangible steps toward Mars which may someday be called “home” by the explorers of the only other likely place for humans to live in this solar system. Additional details can be found at the NASA website. While you are visiting the NASA website, I suggest you check out some of the other exciting happenings by exploring the other missions NASA is currently managing. The spacecraft, Dawn, was launched from Cape Canaveral 27 September 2007, and is now on it’s way to the dwarf planet, Ceres, after having been in orbit around the asteroid Vesta for 14 months, sending back dozens of photographs and other valuable data. 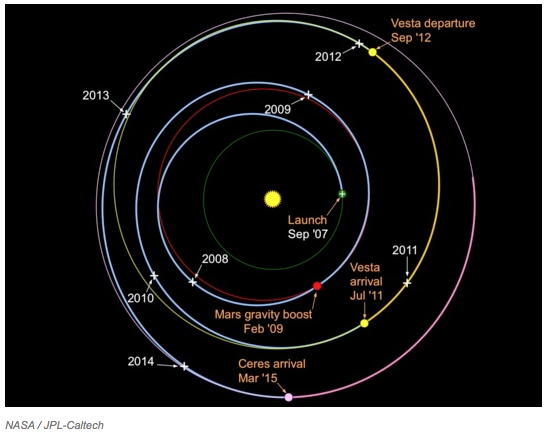 Dawn is on schedule to arrive and enter an orbit around the dwarf planet, Ceres, in August, 2015. For additional information and photos, please visit NASA scientist Marc Rayman’s blog.